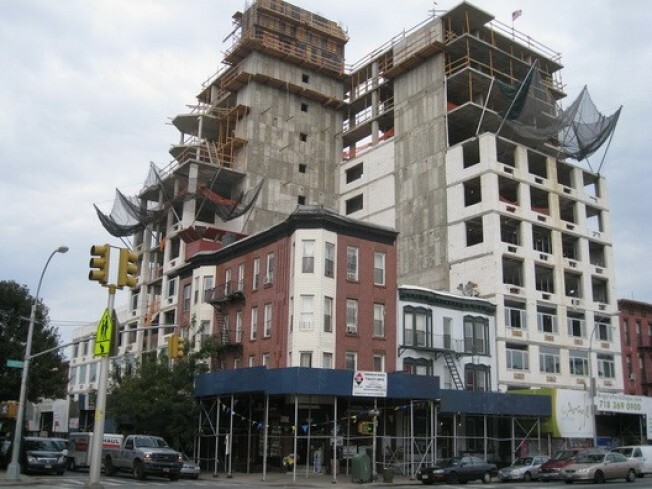 Hey, the Dow may be dropping like a lead balloon today, but we can report that the Argyle, a 60-unit building in what the developers call "Brooklyn's prized Park Slope neighborhood" (and what we call Gowanus) has topped out at 12 stories. The building comes from Meltzer/Mandl and a reported 70 percent of the units are sold. The developer says that "We are thrilled at the progress at the building and are looking forward to welcoming our new residents in just a few months." Judging at where the building is at, "just a few months" might be overly optimistic, but whaevs. The remaining units run from $475,000 to $965,000, but per Streeteasy, it doesn't look like anything has moved in a while.